The Cloud Forests of Monteverde Costa Rica are often described as Mother Nature’s playground! The forests are a must-see for all travelers to Costa Rica; a true paradise with an amazing diversity of flora and fauna - rarely seen anywhere else. Guided hiking tours through the forest are available and are normally about 3 hours and start at 7:30am and 1.00pm. There are several parks in Monteverde (but strictly speaking there are no National Parks as they are all privately owned). The best known park is the Monteverde Cloud Forest Reserve but see below for a list other parks to visit. "Many visitors come to this reserve in hopes of seeing big mammals like jaguars, ocelots or tapirs. Almost no one does. But 10 minutes with a guide on a three-hour walk proves that the plants and insects can be just as captivating — and as deadly. You may see an alligator tree, whose broad, conical spikes were developed to repel the elephant-size sloths that roamed the Americas as recently as 10,000 years ago. Or, a strangler fig, which begins life as an innocent epiphyte delivered into an unsuspecting tree’s branches by a bird, then grows vines up to the sunlight and down to the ground, eventually enveloping the host tree and strangling it. Behind the sinewy crawl of fig roots, an orange-kneed tarantula might be waiting for its prey, hidden to avoid the tarantula wasps that live in the area. The wasps paralyze a tarantula with their sting, lay eggs inside it and wait as the wasp larvae slowly consume the still-living spider from within. Let’s see an ocelot try that. Ask your guide to see huge, leafy elephant ear plants and miniature orchids no more than a millimeter or two across. 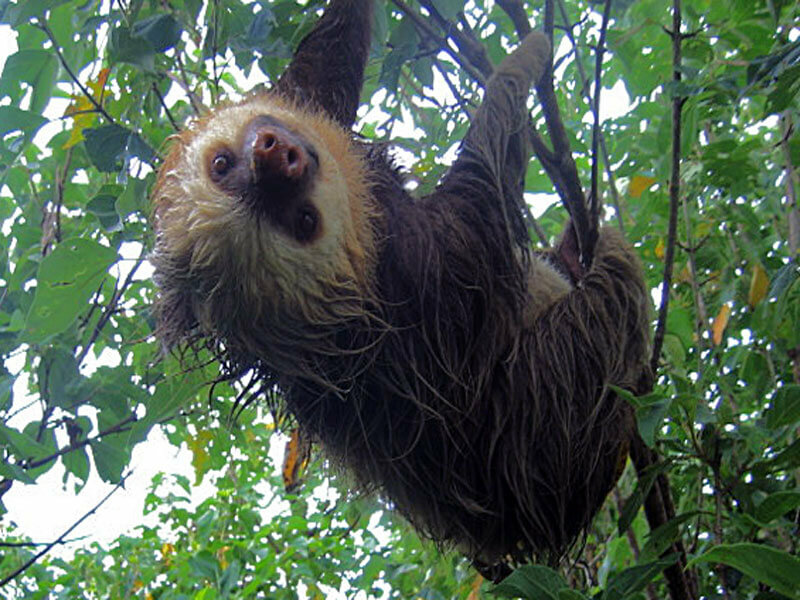 Listen for monkeys and birds overhead, and keep your eye out for sloths sleeping out the day, mattedgray fur tucked into a cradle of branches 20 feet up. Since tourists are unlikely to spot all the wildlife they might wish to, private guides have always operated in the reserve, and in recent years, privately run zoo-like exhibitions have popped up: a bat jungle, a frog pond, a butterfly garden and a serpentarium." Contact us to book or ask for more info about our Costa Rica cloud forest tours and guided hikes. The Monteverde Cloud Forest Reserve is probably the most famous and visited park in the area. It is overseen by the Tropical Science Center of Costa Rica which manages the trails and limits the amount of visitors. It has an elevation of 1500-1800m (4900-5900ft) above sea level. Because of the biodiversity found in Monteverde, this reserve has been praised as one of the most exceptional forest in the world. A hike will take you through well-marked trails with an optional visit to the observation point called “La Ventana”, which is one of the most popular spots in this reserve. The Santa Elena Cloud Forest Reserve was officially opened in 1992 with the help of a Canadian non-profit Organization, the Costa Rican government, and the Santa Elena Community (which now manages the reserve). It has 310 hectares (765 acres) of preserved cloud forest and an elevation of about 1500m (4900ft). Proceeds from entrance fees, guided tours and the souvenir shop are either reinvested in the management of the reserve or are given to a local high school to help upgrade technology, and develop courses in environmental education, biology, agriculture, languages and tourism. The Curi Cancha Wildlife Refuge is made of secondary and primary forest, including cloud forest. The name means “temple of gold”, which comes from the Inca culture. 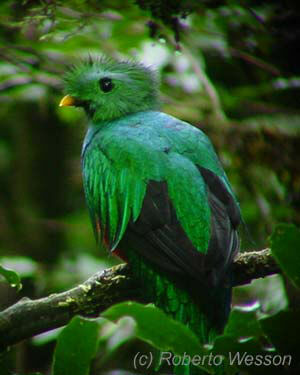 This reserve has various reforestation projects to plant trees that attract species such as the resplendent quetzal. The trails are designed in a way to avoid the feeling of over-crowding. This reserve has about 90 hectares (222 acres), and it’s at an elevation of 1350-1500m (4429-4900ft). The Children’s Eternal Rainforest (Bosque Eterno Los Niños, BEN) is the biggest private reserve in Costa Rica, with 22500 hectares (55598 acres). This reserve is managed by the Monteverde Conservation League, a non-profit organization whose mission is to conserve, preserve and rehabilitate tropical ecosystems and their biodiversity. In 2007 the BEN was declared part of the Peace and Water Biosphere Reserve by UNESCO. If you are visiting the Monteverde area, the most accessible entrance to this reserve is Bajo del Tigre; they offer daytime and nighttime guided tours, the trails are easy and short, specially good for young kids. The Cloud Forests of Monteverde Costa Rica are very famous yet few people know just what a Cloud Forest is!...........A cloud forest is a special type of rain forest. As the name suggests much of the year the forest is immersed in clouds with year-round relative humidity of almost 100%. The source of water encourages the growth of epiphytes, climbers and parasites and almost every branch is home to diverse species of orchids, bromeliads, lichens and others. This special habitat is a result of high elevation, temperature (higher temperature than surrounding lowlands) and global conditions. Costa Rica has very diverse local weather and the Monteverde area is no expectation. There are in fact 5 life zones in the area; tropical premontian, tropical premontian wet, tropical lower mountain wet forest, tropical lower mountain rain forest and tropical premountain rain forest. The phenomenon of high air born moisture is in part a result of the trade winds which blow in from the Atlantic for 5 months of the year. These winds which form in the equatorial zone are created by thermal conditions in different parts of the globe and the spinning of the earth. These general wind patterns of the earth have been known to sailors for centuries. There are other cloud forests in different parts of the world, such as Washington State, but Monteverde is special in its biodiversity. The area is home to more than 450 orchids, 100 species of mammals (that includes bats), 400 species of birds, 120 species of amphibians, and thousands of plants. The reserves are home to Ocelots and Tapir and a small number of Jaguars. Some of the more spectacular birds include the Long Tailed Manikin, Resplendent Quetzal, Bell Birds and Bare-necked umbrella birds. There are also many amazing trees and plants. For example the strangler figs, that start as a parasite among the branches, lowers vines to the ground and over the years cut off the host trees sunlight. In some cases the host tree dies and decomposes leaving a hollow strangler fig tree. This fragile habitat has a number of endemic species that are endangered. Many of the dangers that face the reserves are global problems. Global warming, solar radiation and the ozone layer can have a devastating effect on the flora and fauna of these regions. The Golden Toad is an example of a now extinct species as a result of changes in the worlds climate. Many species of birds in Costa Rica are seen leaving what was thought of as to be their territory in search of foods in higher or lower elevations as the case may be. If temperatures continue to rise some day the cloud forest itself could die. The mountains are only so high and there is a point where the factor of elevation cannot keep the needed cooler climate of the cloud forest. 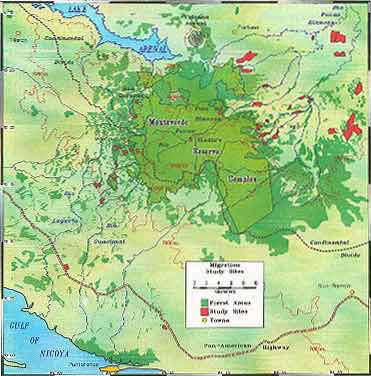 Map was created by David King for use in the GRUAS proposal to the Costa Rica Ministry of Environment using the CAMRIS GIS software. One of the concepts of land protection in the Tilaran / Monteverde area is to create a tract of protected forests traversing a number of elevations providing a corridor to animals and birds. The two private parks as well as many other protected areas such as the Children's Eternal Rain Forest are a part of this corridor. There are many good books about Costa Rican biology and natural history. An excellent resource is the Costa Rican Natural History, edited by Daniel H. Janzen and published by The University of Chicago Press. There is also a new book specifically about the Natural History of Monteverde. We would strongly recommend that all those who visit Monteverde take a hike at one of the reserves mentioned below. A guide is a plus as you will learn a lot but this is an awesome experience with our without a naturalist guide. All the trails are in fair condition and well marked. Maps are provided. See more about our cloud forest tours in Costa Rica here. 25 years ago mysterious crashes in Monteverde Costa Rica’s frog population were noted with alarm. What ecological changes in Monteverde brought this on? Monteverde's Leaf-cutters are one of just a handful of animals that are nature’s farmers. You can fail to come across these truly industrious creatures on a hike in Monteverde. Monteverde Cloud Forest and Nature’s Colors - why are some plants green, why some flowers are red (or other colors), and where do the colors come from? Wild cats in Monteverde Costa Rica. Are there still wild cats in the Cloud Forests of Monteverde? The answer is YES! Interesting article about wild cats!